The Hip Quadrant test is a passive test that is used to assess if the hip is the source of a patient's symptoms. The hip quadrant test is also known as the quadrant scour test. This test is not to be confused with the quadrant test for the lumbar spine. The hip articulation is true diarthroidal ball and-socket style joint, formed from the head of the femur as it articulates with the acetabulum of the pelvis. 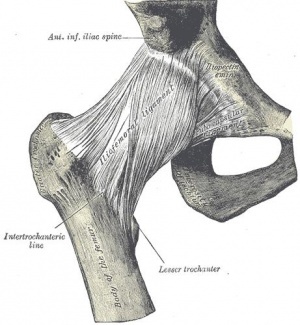 This joint serves as the main connection between the lower extremity and the trunk, and typically works in a closed kinematic chain. Thus is designed for stability and weight-bearing – rather than a large range of movement. Motions available at the hip joint are flexion, extension, abduction, adduction, internal rotation and external rotation. The ligaments of the hip joint act to increase stability. They can be divided into two groups – intracapsular and extracapsular. The purpose of the Hip Quadrant test is to determine if there is a nonspecific hip pathology and a change in ROM. This test does so by completing the ROM from flexion and adduction to flexion and abduction. This test is also capable to detect early hip degeneration. The patient is positioned in supine on the plinth. The therapist stands on the side of the leg to be tested. The affected limb is placed in adduction and a compression force is applied and maintained through the femur through a range of 70-140 degrees of hip flexion. The test is repeated in abduction. A positive test is a reproduction of the patient's worst pain that they came with into the clinic. The test is considered positive if the patient has any pain. The test is also positive if the therapist can feel any crepitus or if there is a leathery end feeling or if there’s a loss in ROM. The test is considered negative if you can go from flexion-adduction to flexion-abduction in an arch, a normal ROM and with a normal end-feeling. This test works by scouring the femoral acetabular joint for pathology. The compression of the femur, through the various ranges, stresses the bone, labrum, cartilage, ligaments, etc. While this test has been labeled as the "hip clearing test," due to the low diagnostic accuracy, it should not necessarily be used as such. Consider the results of the rest of your exam when trying to determine the pathology. A positive Hip Quadrant test is an indication that there might be arthritis, an osteochondral defect, avascular necrosis, joint capsule tightness and/or an acetabular labrum defect. This test also detects if the patients hip can move through the full range of motion. Th hip quadrant test does not give us any significantly useful information. Due to the wide range of structures that can be stressed, its results should be interpreted with caution. No validity or reliability studies could be located for its diagnostic validity. Minimal data is available on the significance of the Hip Quadrant alone. However, the American College of Rheumatology provide an alternative method for the diagnosis of hip OA. If at least 4 of 5 variables were present, the positive LR was equal to 24.3 (95% confidence interval: 4.4-142.1), increasing the probability of hip OA to 91%. ↑ 2.0 2.1 2.2 Cook CE, Hegedus EJ. Orthopedic Physical Examination: An Evidence based Approach. Upper Saddle River, NJ: Pearson Prentice Hall; 2008. ↑ 12.0 12.1 Altman R, Alarcon G, Appelrouth D, et al. The American College of Rheumatology criteria for the classification and reporting of osteoarthritis of the hip. Arthritis Rheum 1991: 34l 505-514.